^ A Science Odyssey: People and Discoveries. PBS. 1998 [2007-08-14]. ^ Aylward R. Eradicating polio: today's challenges and tomorrow's legacy. Ann Trop Med Parasitol. 2006, 100 (5-6): 401–13. PMID 16899145. ^ Schonberger L, Kaplan J, Kim-Farley R, Moore M, Eddins D, Hatch M. Controof paralytic poliomyelitis in the United States. Rev. Infect. Dis. 1984,. 6 Suppl 2: S424–6. PMID 6740085. ^ Update on vaccine-derived polioviruses. MMWR Morb Mortal Wkly Rep. 2006, 55 (40): 1093–7. PMID 17035927. ^ 5.0 5.1 5.2 5.3 Kew O, Sutter R, de Gourville E, Dowdle W, Pallansch M. Vaccine-derived polioviruses and the endgame strategy for global polio eradication. Annu Rev Microbiol. 2005, 59: 587–635. PMID 16153180. ^ Wild Poliovirus Weekly Update. 2008 [2008-01-18]. （原始内容存档于2012-02-26）. ^ Poliomyelitis: Fact sheet N°114. World Health Organization. Oct 2015 [14 Dec 2015]. 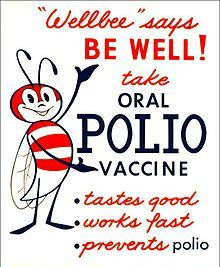 ^ Vaccine, Polio. International Drug Price Indicator Guide. [6 December 2015]. （原始内容存档于2017年2月28日）. ^ Hamilton, Richart. Tarascon Pocket Pharmacopoeia 2015 Deluxe Lab-Coat Edition. Jones & Bartlett Learning. 2015: 316. ISBN 978-1-284-05756-0. ^ 12.0 12.1 Pearce J. Salk and Sabin: poliomyelitis immunisation. J Neurol Neurosurg Psychiatry. 2004, 75 (11): 1552. PMID 15489385. ^ Rainsberger M. More than a March of Dimes. The University of Texas at Austin. [2007-01-29]. （原始内容存档于2006-06-30）. ^ The Nobel Prize in Physiology or Medicine 1954. The Nobel Foundation. [2007-01-29]. ^ Hammon W, Coriell L, Wehrle P, Stokes J. Evaluation of Red Cross gamma globulin as a prophylactic agent for poliomyelitis. IV. Final report of results based on clinical diagnoses. J Am Med Assoc. 1953, 151 (15): 1272–85. PMID 13034471. ^ Lindner U, Blume S. Vaccine innovation and adoption: polio vaccines in the UK, the Netherlands and West Germany, 1955-1965. Med Hist. 2006, 50 (4): 425–46. PMID 17066127. 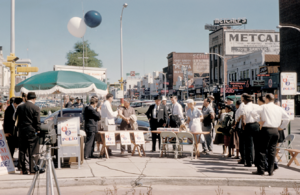 ^ Polio Victory Remembered as March of Dimes Marks 50th Anniversary of Salk Vaccine Field Trials. News Desk. 2004-04-26 [2007-03-12]. （原始内容存档于2008-09-19）. ^ Competition to develop an oral vaccine. Conquering Polio. Sanofi Pasteur SA. 2007-02-02 [2007-03-12]. （原始内容存档于2007-10-07）. ^ Smith, Jane S. Patenting the Sun: Polio and the Salk Vaccine. William Morrow & Co. 1990. ISBN 0-688-09494-5. ^ [edited by] Edmund J. Sass with George Gottfried, Anthony Sorem; foreword by Richard Owen. Summary Polio's legacy: an oral history 请检查|url=值 (帮助). Washington, D.C: University Press of America. 1996. ISBN 0-7618-0144-8. ^ Sabin A, Ramos-Alvarez M, Alvarez-Amezquita J, Pelon W, Michaels R, Spigland I, Koch M, Barnes J, Rhim J. Live, orally given poliovirus vaccine. Effects of rapid mass immunization on population under conditions of massive enteric infection with other viruses. JAMA: 1521–6. PMID 14440553. ^ 23.0 23.1 Charles Chan and Roberto Neisa. "Poliomyelitis". 互联网档案馆的存檔，存档日期2007-02-22. Brown University. ^ Gromeier M, Bossert B, Arita M, Nomoto A, Wimmer E. Dual stem loops within the poliovirus internal ribosomal entry site control neurovirulence. J Virol. 1999, 73 (2): 958–64. PMID 9882296. ^ Hinman A. Landmark perspective: Mass vaccination against polio. JAMA. 1984, 251 (22): 2994–6. PMID 6371280. ^ 27.0 27.1 Cono, Joanne and Lorraine N. Alexander. (2002). VPD (Vaccine Preventable Disease) Surveillance Manual, 3rd Edition, Chapter 10, Poliomyelitis 互联网档案馆的存檔，存档日期2006-11-23. p.10-1. ^ Yang C, Naguib T, Yang S, Nasr E, Jorba J, Ahmed N, Campagnoli R, van der Avoort H, Shimizu H, Yoneyama T, Miyamura T, Pallansch M, Kew O. Circulation of endemic type 2 vaccine-derived poliovirus in Egypt from 1983 to 1993.. J Virol. 2003, 77 (15): 8366–77. PMID 12857906. ^ Liang X, Zhang Y, Xu W, Wen N, Zuo S, Lee L, Yu J. An outbreak of poliomyelitis caused by type 1 vaccine-derived poliovirus in China. J Infect Dis. 2006, 194 (5): 545–51. PMID 16897650. ^ Racaniello V. One hundred years of poliovirus pathogenesis. Virology. 2006, 344 (1): 9–16. PMID 16364730. ^ Kew O, Wright P, Agol V, Delpeyroux F, Shimizu H, Nathanson N, Pallansch M. Circulating vaccine-derived polioviruses: current state of knowledge. Bull World Health Organ. 2004, 82 (1): 16–23. PMID 15106296. ^ 35.0 35.1 Simian Virus 40 (SV40), Polio Vaccine, and Cancer. Centers for Disease Control. April 22, 2004 [2007-02-03]. ^ Eddy B, Borman G, Berkeley W, Young R. Tumors induced in hamsters by injection of rhesus monkey kidney cell extracts. Proc Soc Exp Biol Med. 1961, 107: 191–7. PMID 13725644. ^ Carbone M. Simian virus 40 and human tumors: It is time to study mechanisms. J Cell Biochem. 1999, 76 (2): 189–93. PMID 10618636. ^ Vilchez R, Kozinetz C, Arrington A, Madden C, Butel J. Simian virus 40 in human cancers. Am J Med. 2003, 114 (8): 675–84. PMID 12798456. ^ Engels E. Cancer risk associated with receipt of vaccines contaminated with simian virus 40: epidemiologic research (PDF). Expert Rev Vaccines. 2005, 4 (2): 197–206. PMID 15889993. （原始内容 (PDF)存档于2006-09-23）. ^ Debbie Bookchin. Vaccine scandal revives cancer fear. New Scientist. 7 July 2004 [2007-02-03]. ^ Strickler H, Rosenberg P, Devesa S, Hertel J, Fraumeni J, Goedert J. Contamination of poliovirus vaccines with simian virus 40 (1955-1963) and subsequent cancer rates. JAMA. 1998, 279 (4): 292–5. PMID 9450713. ^ Olin P, Giesecke J. Potential exposure to SV40 in polio vaccines used in Sweden during 1957: no impact on cancer incidence rates 1960 to 1993. Dev Biol Stand. 1998, 94: 227–33. PMID 9776244.